Latest update on donors (11th Oct 2013) - please see table below. Note: The balance will be used to buy school items (uniform, shoes, bag, stationery) for the children in the Home for next school year, 2014. 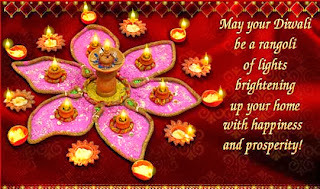 We are delighted to announce that we have received overwhelming contributions for our forthcoming Deepavali event. 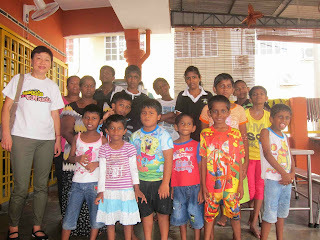 A big thank you to all donors for helping us make this Deepavali a "warmer" and happier one for the Children. Deepavali, also known as the "Festival of Lights," symbolizes the victory of good over evil, and lamps are lit as a sign of celebration of hope, happiness and peace for humankind. Come join Ti-Ratana Meals on Wheels as we celebrate Deepavali with children from Pusat Jagaan Kanak-Kanak Istimewa Lagenda. Lets do our bit to show the children we care enough to light up their lives, even if it is just for a day. These “Istimewa” children are special, not because they are physically or mentally challenged. They are special because they belonged to this BIG HAPPY FAMILY of this truly kind hearted couple, Sara and Selvam. Sara and Selvam have 5 children of their own. However, their big heart and love for children have motivated them establish this home 4 years ago. 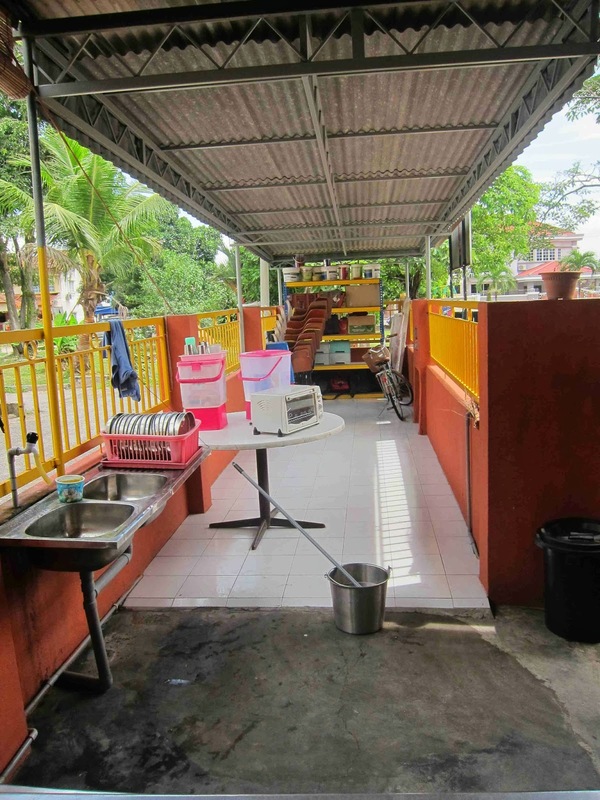 This double-storey corner house is rented at RM700 per month, and houses 22 children and 4 adults, excluding Sara and her family who live in another house. All the 4 adults help out in the running of the Home. The Home is clean and well-maintained which is important for the well-being of the children. The children, aged from 4 years to 18 years, are mostly from abusive environments or have been abandoned by their parents. Living in this Home, the children are provided with shelter, love and care, and most importantly are able to go to school. As the Home does not have its own vehicle, Sara pays RM50 per month per child for transport to and from school. This comes to RM1,000 per month. 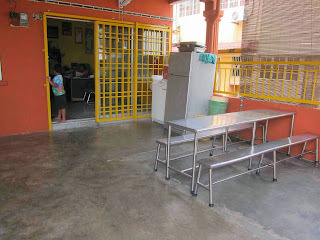 The children also get RM1 per day as pocket money to school, or total of RM500 per month. Utilities comes to about RM300 per month while the monthly food bill is about RM3,000. 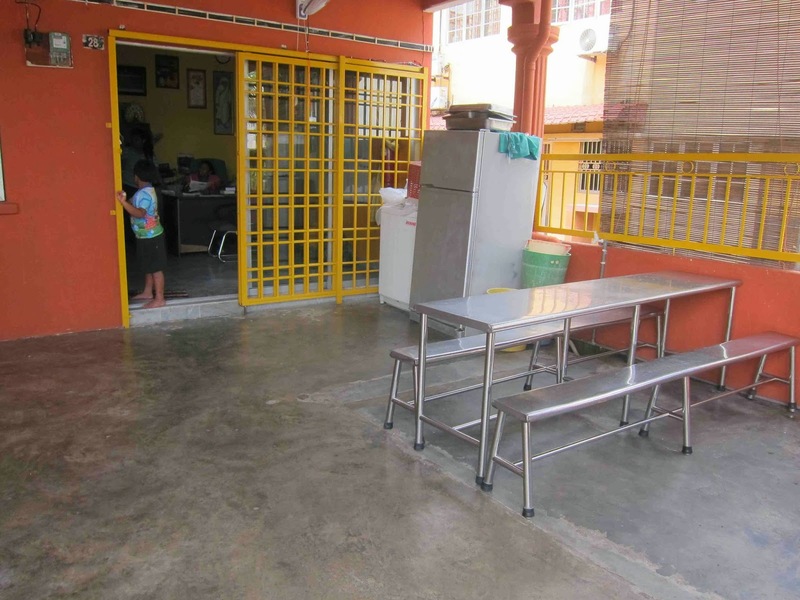 With other miscellaneous expense, Sara needs about RM6000 per month to run the Home. Funding comes from donations from companies and private individuals, whilst the 8 committee members of this Home chip in whenever they are short. Fortunately, all donations to the Home are tax-exempted. Selvam is a sales person with Electrolux, while Sara takes care of the Home full time, together with her step-sister Vanaja and Jayanthi a single mother. Vanaja is divorced from her drunkard husband and has 4 children staying in the Home. Jayanthi has one child in the Home. On my first visit to the Home on 20th Sep 2013, the children were having lunch as most are in the afternoon session school. They eat in the porch, some sitting on the bench and some on the floor. The living room is where the boys sleep while the girls sleep in the rooms upstairs. The children appears healthy and clean, and most importantly Happy. 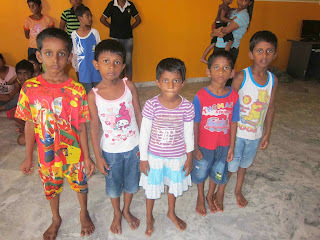 How different their lives would have been if they have not been “adopted” and taken into this Home by Sara and Selvam. This kind-hearted couple worked hard to give these children a place they can call home. 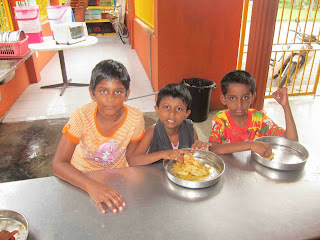 Let us give them a helping hand to make this year’s Deepavali a very “Istimewa” one for the “Istimewa” children. The Home requested for water heaters so that the children can have hot showers in the chilly mornings and a rice cooker. We are also looking for contributions for the event such as food, entertainment and new clothes for the children. All items must be delivered to Ti-Ratana Community Centre Penchala by 3pm, Wednesday, 23rd Oct 2013, to give the committee sufficient time to buy and pack any outstanding items. Apart from these, we are also seeking individuals or group of individuals who have experience in organizing entertainment for the children, including dancing, singing, games, etc. Please arrive at the Ti-Ratana Penchala Centre by 10:30am. We shall convoy together to Klang thereafter. No transportation will be provided, so kindly ensure you make your own arrangements if you wish to carpool with other volunteers to get to the event venue and back to the Centre. We look forward to another fun-filled and memorable celebration with our volunteers and the children. Ever since we started our MOW HAPPY CHILD program, it has always been our wish to visit sick children in the hospital, and organize activities to bring some cheer to them. We finally got our wish when we celebrated Hari Raya Aidil Fitri with children in the Institute of Pediatric in Hospital Kuala Lumpur on Sunday, 8th Sept 2013. As usual, our journey started off from our centre in Penchala, where the MOW van is ready to be loaded with goodies for the children and hospital staff. We were greeted by the sister-on-call who informed us that the chosen ward, KK5, had less than 10 children, and that she would have to go to four to five wards to get 40 children. Furthermore, most of the children are quite ill and not particularly mobile. Our program for that morning was to gather all the 40 children in a ward and have fun with games and other activities. We had to quickly review and rework our program to accommodate the situation. Fortunately, everything worked out. Instead of having all the children in a single ward, the MOW volunteers made their "rounds" to several wards, including the ICU, the High Dependency Ward and Burnt Unit. With armful of goodies including Minions soft toys, tee-shirts, chocolates, jigsaw puzzles, and coloring books, MOW volunteers happily visited and chatted with the children and their mothers. However, the biggest excitement for the children (and the nurses too), was the appearance of three superheroes ... namely Spiderman, Incredible Hulk and Captain America, thanks to Bro Steven, Bro Andrew and Bro Ivan. The superheroes had as much fun as the children, if not more! I think the three "superheroes" were reliving their childhood dreams! KFC's Chicky Mascot was also a big hit, entertaining the children, together with KFC staff who brought party packs for the children. Lunch was of course KFC lunch box and yummy cup cakes. The dedicated hospital staff were also not forgotten, and were presented with goodie bags by our MOW volunteers. After completing our ward rounds and making sure we visited all the 40 children, MOW volunteers gathered for a group picture in the lobby of the Institute of Pediatric, with the colorful wall as the backdrop. Everyone was all smiles and warm-hearted, after a very MEANINGFUL and BEAUTIFUL morning with the CHILDREN who were indeed the VVIPs and STAR of the day. Ti-Ratana Community Centre Penchala, Datin Catherine Lai, thanked everyone who made the visit a success, and hoped that our new volunteers will continue to support our MOW programs. All volunteers who contributed to this event, in one way or another. Click below to view a video of the celebration. Since we posted the plight of these two families in early Aug 2013, many generous individuals have come forward with generous contributions in cash and kind. The amount we have collected so far is adequate to support Mdm Chin for the extras she has to spend for her mother's nutrients and treatment, and Uncle Chin for his son's education expenses, for the next one year or so. 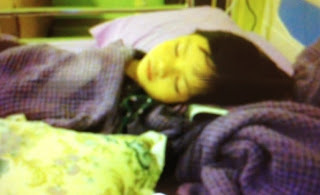 Mdm Yap (Chin's mother) is now undergoing weekly accupuncture treatment from a Sinseh from Rawang who makes house calls. After two sessions, her daughter informed us that she appears to be getting better, i.e. able to talk a little. We hope she will continue to show good progress with all the from our donors. With this blog posting, we would like to announce that we are no longer accepting cash contributions to the Chins. If you wish to donate to the Chins, you can give directly to the families. If you wish to do so, kindly contact June at 03-77849002 or trccpenchala@gmail.com, for the families contact details. The families are truly grateful to the care and support shown to them. This month, we welcome Uncle Chin and his niece, Soo Yuen to our MOW FOOD BANK program. Soo Leng (Soo Yuen's sister) and her husband were quite shock when they saw the pile of goodies we brought, this being their first month as recipient of our MOW FOOD BANK program. In addition to the usual groceries, we also brought 1 month supply of diapers and disposable underpad for her mother who is bedridden with stroke. We even brought moon cakes for the families, courtesy of one of our donors. Uncle Chin's only child, Chuan Yoong happily posed for a picture...aren't his dimples just adorable!!! In the home of Mr Chok ... Bro Ivan always have a ready smile for the two orphans, Chloe and Lucas. On Sat, Kim and Lew delivered groceries to families in Desa Rejang, and were invited to a Raya Open House organized by several of the families along the corridor of their flat. We sampled the home-cooked Kelantan laksa and laksam ... both were yummy! Despite the space constraint, the families make do with what they have and are obviously enjoying the festivities. As some of the families were not at home when we delivered the groceries, the items were all temporarily stored in Aida's house. Over at Taman Melati, Zabiyah and her elderly mum came down to collect the groceries, while Fazilah's kind neighbor helped her carry the groceries up to her flat. As usual, we also brought Peptamen Junior milk and diapers for Fazilah's daughter, Siti Nurmaisara. In Sentul, Vijaya and her sons received the groceries from us, including diapers and Everyday milk for Sasi. Another month of groceries delivered, means food on the table for the PPR families for at least the next couple of weeks or even a month for smaller families. Also a big thank you to Fung Wong Biscuits for the halal mooncakes which were distributed to all the 19 families. Latest update (18 Oct 2013) : GOOD NEWS!!! 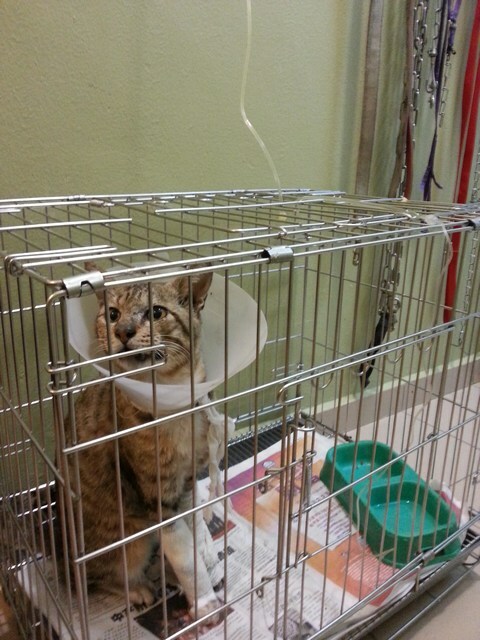 Valentino responded well to the treatment for his infection and was discharged on 5 Oct 2013. He left for home in Sarawak on the same day. He will be returning to UMMC for his quarterly check-up, and MOW will continue to support him. Thank you Datin Shiou Bin for your contribution towards Valentino's well-being while he was in UMMC. 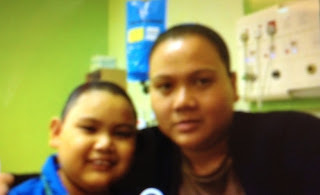 Valentino, an 8 year-old Iban boy from Sarawak was diagnosed with Severe Aplastic Anemia, a rare and serious blood disorder, in Jan 2013 by doctors in Hospital Kuching. 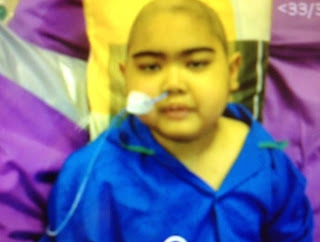 In Mar 2013, he was transferred to UMMC (PJ) for a bone marrow transplant (BMT). He underwent the BMT procedure and after 3 months plus in UMMC, he returned to Hospital Kuching in July 2013. His 4 year-old sister was the donor. Two weeks after returning to Kuching, he had a serious infection on the right side of his brain that caused paralysis on the left side of his body – he could not talk, eat or move. He was transferred back to UMMC in July 2013, and after more than a month of treatment, he is able to talk, eat and move but is still unable to walk. 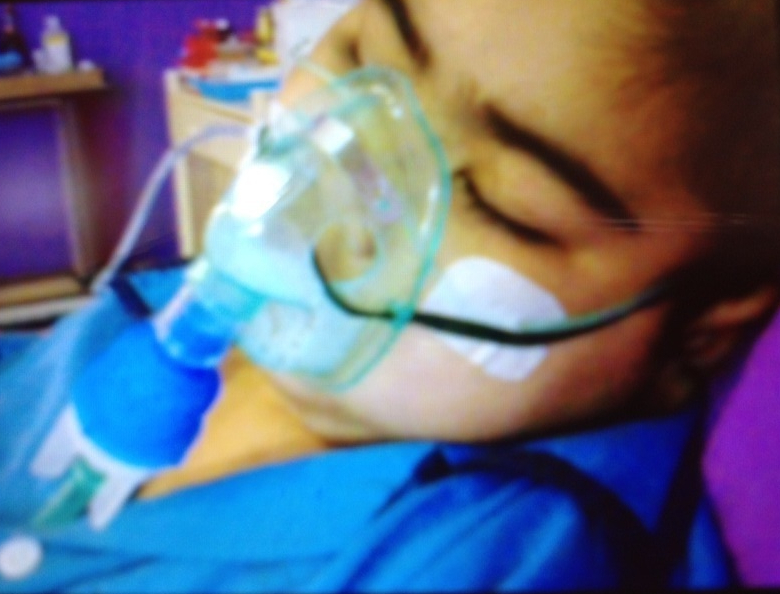 However, the infection has moved down to his lungs and he is now battling with lung infection and tuberculosis. He eats porridge and Peptamen Junior milk provided by the hospital. The mother, Lily, does not know how much longer he needs to be treated in UMMC. Lily practically lives in the hospital. Her husband sends her RM250 per month, which is barely enough to cover her own meals and her son’s needs. She sometimes skipped meals when she runs out of funds. The good doctors in UMMC personally help with the son’s diapers and sometimes buy food for her. His father, Edward Sadai works as a labourer in a timber camp with a monthly salary of RM700. Lily, the mother is a housewife. His two younger siblings, Clerrintia Mas aged 4 yrs and Riskey Garie 3 yrs live with the grandmother, as Lily is taking care of Valentino at UMMC. She is not able to get help from her or her husband’s siblings. Valentino is MOW HAPPY CHILD’s third candidate. His needs of diapers and wet wipes will be funded from Datin Shiou Bin’s donation, for as long as he is undergoing treatment in UMMC. 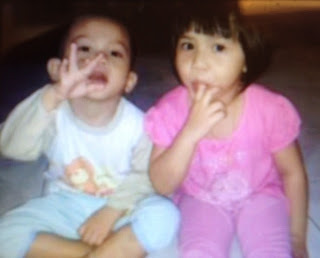 Thank you so much Datin - Lily and Valentino are truly grateful for your kind and generous contribution. This cat was brought to the clinic in a very critical condition by Ms Chia. 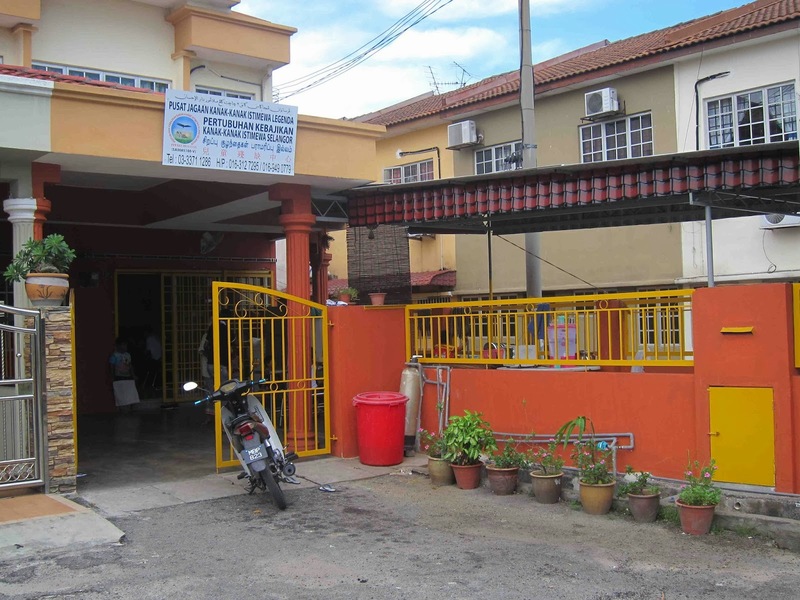 Ti-Ratana MOW GRANTS contributed a small sum via AnimalCare, to the hefty bill of RM2550.00. The cat is now recovering in Ms Chia's home. She is trying to find a permanent for the cat, failing which she is likely to adopt the cat herself.